What is a Tolerance Bandwidth? If you read my post on the human-environment interaction that results in disability you will already know where I am coming from. I posit that discomfort, like disability, is the result of a human-environment interaction. You are comfortable when the environment is somewhere within your preferred range of conditions. I will call this range your tolerance bandwidth. If your tolerance bandwidth is wide, the environment can be quite varied and you would still be comfortable. If you have a wide tolerance bandwidth you aren’t bothered by heat or cold, going without eating all day, sitting down in mud, being bitten by mosquitoes or hiking in wet jeans for hours. 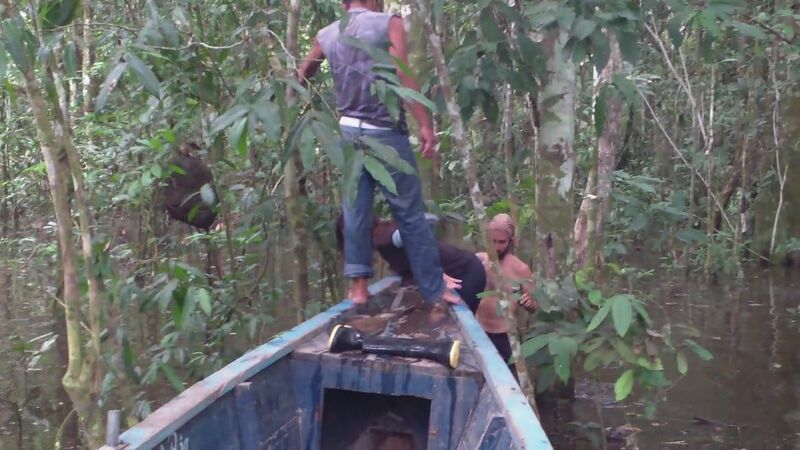 Raul at the front of the boat, sporting the soaked jeans he has been wearing all day and preparing to enter the flooded forest with us again in search of a macaw clay lick. There is probably an environment in which the majority of the world people could be comfortable: temperature at 69 degrees, relative humidity of about 45%, soft surfaces present, and biting insects conspicuously absent. Sound like the environment you are in while reading this blog? It probably is. The vast majority of my time spent in the U.S. has been in such an environment. And why not? It is easy to be comfortable in this environment—and fossil fuels can easily do all the work of creating this environment for us. The heater, air-conditioner, humidifier, insecticide, and soft fabrics, all of these things are readily accessible. But in the Amazon, fossil fuels, although available (indeed the rainforest is being plundered for oil as I write) have left much of the environment uncontrolled. Often the air is hot, humid, and mosquito ridden and you have to decide if you want to spend your very own energy (not that of oil) adjusting the environment. Sometimes this is as easy as putting on insect repellent. Other times this environment control means restricting when you are active, hiding in the shade under a bug net, and trying to build a wet wood fire. Instead of spending your own energy on manipulating your environment or being controlled by it, maybe you could just adjust the parameters on your comfort meter? How about widening your tolerance bandwidth to be OK with being hot, or wet or itchy? This is much easier said than done (and especially unpleasant when it is said to someone else). Coming from the precedent of climate control I felt compelled to manipulate my environment to fit my narrow tolerance bandwidth. This includes my tendency to try to make every situation as efficient, ergonomic and comfortable as possible. This quickly became exhausting. 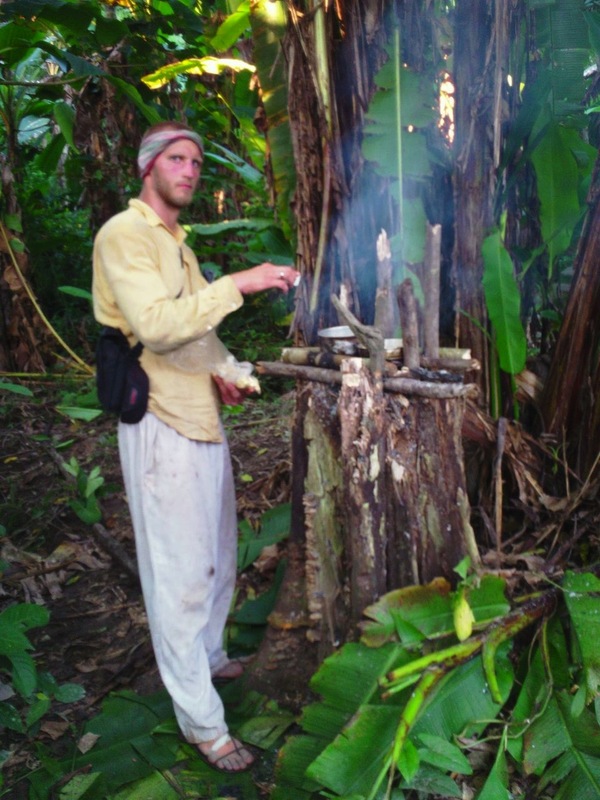 Many of the people here in the Amazon have opted for the wider bandwidth instead of the extra work of personal environment control, and I think my time in the Amazon widened my own as well. 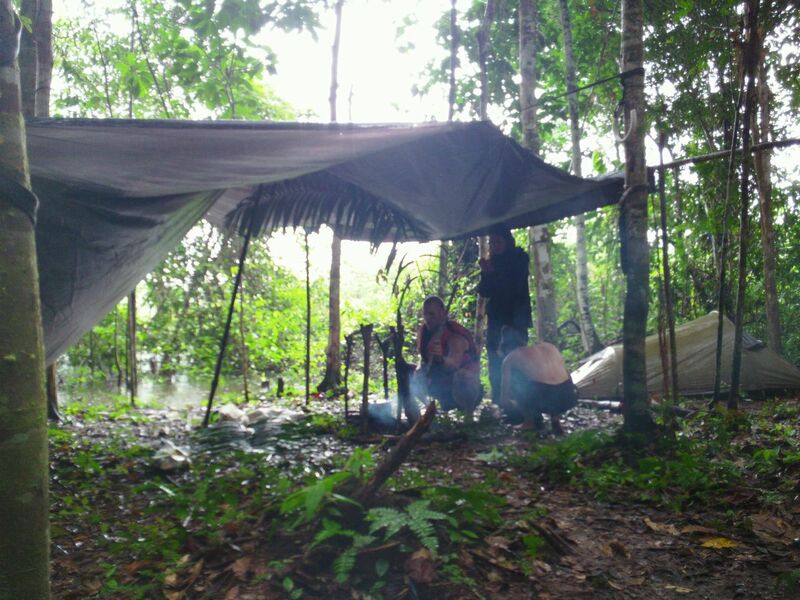 After trying to nap for an hour or so in a hammock wearing my wet clothes, I decided to put up this shelter and work on building up a fire despite the wet wood. All of my clothes were wet and it was too cold to go without them. Instead of trying to widen my tolerance bandwidth, I went for the environment control option. It wasn’t easy. What Determines the Tolerance Bandwidth? The width of one’s tolerance bandwidth is determined by ones sensitivity and attention to followed by one’s interpretation of the stimuli, and finally one’s capacity for inhibition. For example: you notice a fly land on your arm (sensitivity and attention), you recognize it is not a biting fly (interpretation), and you decide not to swat at it (inhibition). You could widen your tolerance bandwidth by changing any one of these parameters. For example, you could impair your attention with alcohol, improve your interpretation by learning what stimuli are worth responding to, and increasing your inhibition by willing yourself not to scratch those infected mosquito bites. There is of course, more to this whole tolerance thing. At some point physiological variables do come into play, but I am convinced that the majority of the difference in comfort levels between people lies in the brain. Maybe your tolerance bandwidth is skewed in one direction; you can pick up potatoes out of the fire without a problem, but feel like your hands will fall off when you try to fish a can of out a cooler filled with ice water. But it seems unlikely that the flashpoint or the freezing point of your hand is higher than mine. Anyone want to weigh in on the biology of comfort differences? 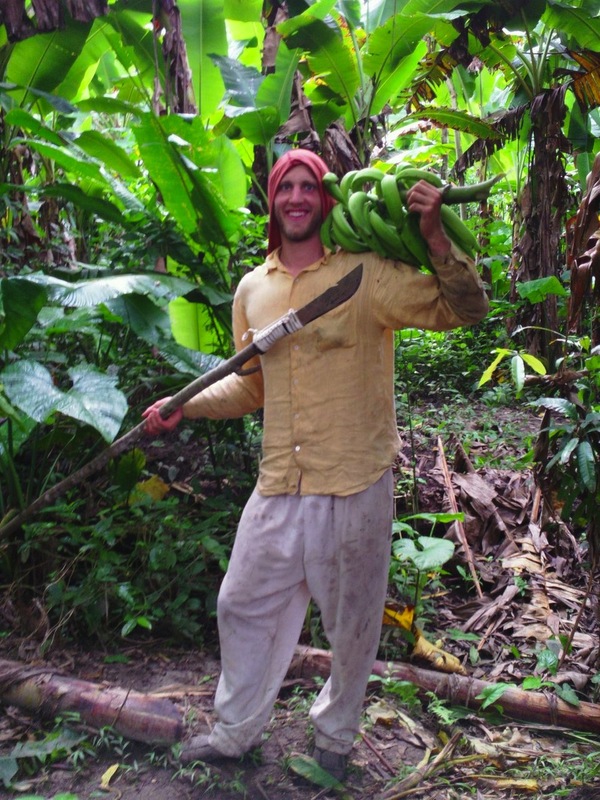 Some examples of me trying to make everything in my life ergonomic, efficient and comfortable even in the jungle. Me in front of the fire I build on top of a stump because my back was aching while bending over at fires on the ground. It worked well for the first round of food but eventually fell apart. A banana chopper I made by lashing my machete to a long pole. No climbing necessary. Notice my long sleeve shirt, long pants, socks and shirt on my head all to reduce the amount of skin area exposed to biting insects. When the temperature was around 80F, the question of comfort was more more like pick-your-poison: Would you rather be hot from wearing long sleeves, or be attacked by biting insects? I chose the heat option. I never quite got used to the feeling of being bitten. I always took it too personally. Toleration of an environment can be greatly increased (though one is not accustomed to that environment) by setting one’s body, soul, and spirit to focus on the reason you are in that environment. For your guide, his focus was to bring you to the macaw clay licking site. As he noted, he had done it before, knew what to expect, and personally, I think he wanted to show off he was tougher than you! Smile! Perhaps, if he was with his amigos, he might have stopped more often and had more mariendas, but I seriously doubt he would change his clothes. More clothes to carry is cumbersome and unnecessary. Smile. My guess is being wet in water or wet jeans, is probably the same to him. Soldiers, on the other hand, when in hostile environments have a mission to accomplish and therefore are more likely able to broaden their tolerance bandwidth as it is a matter of survival. Their focus is not on the hardship, but on the mission they were sent to accomplish. They are more alert to the sound of the enemy than the buzz of a mosquito. Your observation that we are taught an acceptable tolerance level according to the scope of our environment seems to me correct. It is learned, as the result of conditioning even from childhood. But the width of that tolerance bandwidth expanding is dependent on whether we focus on ourselves and the environment we are in, or look beyond that environment and focus on a greater purpose. I marvel at the Ecuadorean people, soldiers, but most of all, those who are willing to widen their tolerance bandwidth, not for the sake of their adding a notch in their ego survival belt, but for broadening their tolerance bandwidth for a higher calling, a higher calling of serving others and sharing love of God.